And you thought I would start the New Year with a salad or smoothie..oh no no, not this girl, let’s just say all those” resolutions are out the window already. What day are we on? January 8th? It only took me 8 days to eat pasta, donuts, add butter to my risotto and yes I am still drinking that glass of wine. I never get into the whole resolution thing. Why do you have to wait until January 1st to make changes?? I think you should make changes when you are mentally and emotionally ready! Of course my waist line thinks differently. Let’s just say it’s begging me to get on the “can you stop eating already and have a carrot” bandwagon. But what can you do when your friends birthday get together is a food tour of LA with pasta and donuts. I couldn’t miss that! 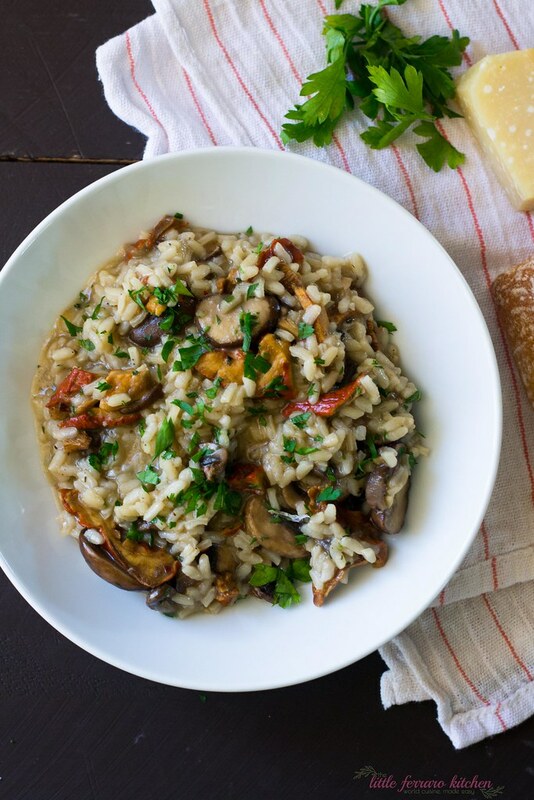 A labor of love that is totally worth it, risotto is not one to make in a hurry. It requires patience and composure, but trust me when I say the end result is more than worth it. 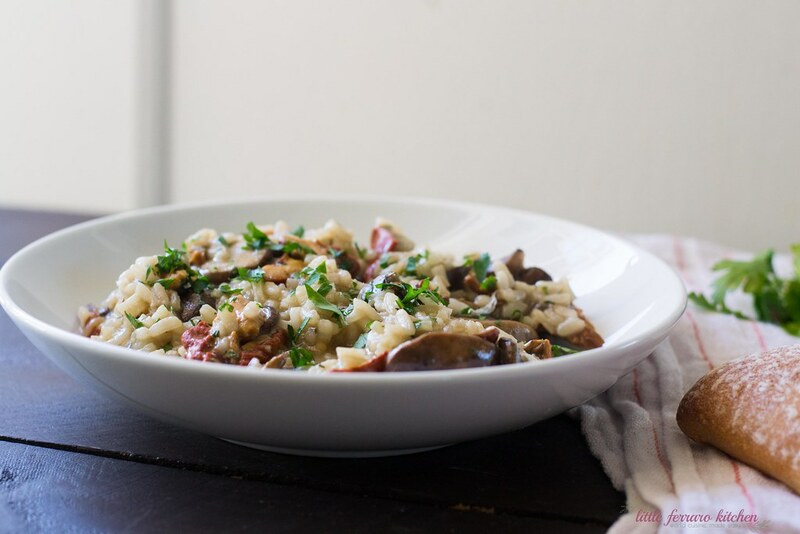 Slaving over boiling stock and stirring for 20 minutes isn’t exactly a walk in the park, but when you take a bite of that perfectly creamy and smooth mushroom risotto, you’ll happily pat yourself on the back and relish in it’s perfect glory. There is nothing more satisfying than a well done plate of risotto. And here is a short guide on what I look for when making risotto. First photo is dry rice and as it soaks up the stock, the rice expands and starts to get creamy. Fill a bowl with warm water and add dried mushrooms in. Allow them to soak for at least 20 minutes. Next, in a small pot, start boiling the stock and add the mushroom liquid, being careful to not pour in the "grit" that settles on the bottom of the bowl. Bring stock to a low boil. In the same large skillet on medium heat, drizzle with a bit more olive oil and add rice and toss to coat. Next, pour wine into risotto and stir until absorbed. Next, use a ladle to add stock to the rice, 1-2 ladleful at a time until rice absorbs all the liquid. Continue to do this for about 18-20 minutes. (*Note: At this point stay close to the stove, constantly stirring the rice). Season with salt and pepper. Towards the end, taste for doneness of the rice and seasoning, should not be too hard or too mushy. Once done, stir in the mushroom mixture, add the butter and 1 more ladleful of stock. Turn off the heat and cover allowing everything to blend together. Once everything is done, grate fresh Parmesan cheese and stir gently. Garnish with fresh herbs. 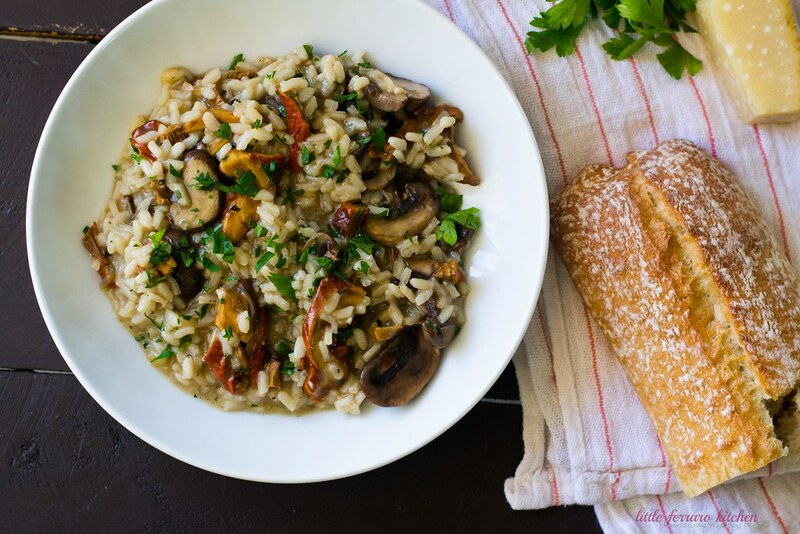 For more Italian dinner inspiration, pair mushroom risotto with my beef braciole recipe stuffed with prosciutto and Parmesan.